As a Nutrition Specialist here at Nutricia North America, I spend a lot of time talking to patients, parents, and healthcare professionals. Some of the questions I receive most often are “Do Neocate products contain any ingredients derived from corn?” and “Are Neocate products safe for an individual with a corn allergy?” I want to explain a bit more about corn allergy, and then discuss the corn ingredients used in Neocate products. True allergic reactions to corn are rare, and often difficult to diagnose using standard skin or blood tests. True corn allergies happen when the immune system reacts to the protein in corn, so you could call them a corn protein allergy. Consult a board-certified allergist to identify the right allergy tests and diagnose any food allergy. A true corn protein allergy can be difficult to diagnose through traditional methods. (Some individuals seem to have a sensitivity to the carbohydrate in corn, which is even more difficult to diagnose, and not well understood.) If your allergist suspects a corn allergy, he/she may recommend a food elimination diet in which you avoid corn and many derivatives of corn for a given period of time (often two to four weeks). During this time, your symptoms will be monitored to determine if there is any improvement while corn is eliminated from the diet. The next step might be to reintroduce corn foods to your diet to see if symptoms reoccur, termed an “oral food challenge.” If you’ve had severe allergic reactions to food in the past, the allergist may want you to do it in her/his office, which is called a “supervised trial.” Adding corn foods back into your diet is the best, most reliable way to confirm that the corn was the true culprit. However, it may seem excessive if your symptoms improved on the corn elimination diet. 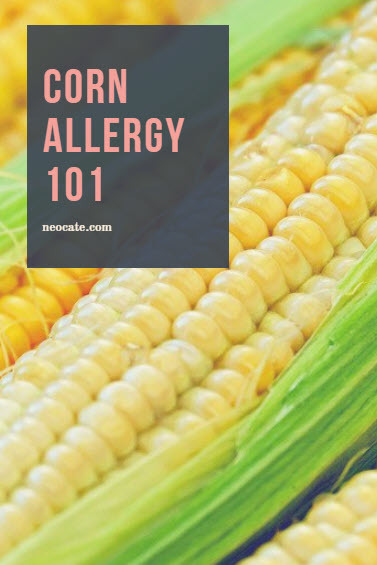 If a corn allergy is identified by the allergist, managing the allergy would involve completely avoiding corn and many ingredients derived from corn. Corn is not among the top eight food allergens in the United States, for which special label information is required by the Food Allergen Labeling and Consumer Protection Act (FALCPA) of 2004. Because corn is not required to be called out on a food label, it is important that anyone diagnosed to have a corn allergy ask the allergist specifically what ingredients to avoid. A registered dietitian nutritionist can also help provide education on a corn elimination diet. Please note, these are just a few examples and not a comprehensive list of ingredients derived from corn. If you are ever unsure as to whether an ingredient is derived from corn or if you should avoid it, contact the manufacturer to ask if the ingredient is derived from corn. Carbohydrates are essential for life, so carbohydrate ingredients are in every nutritionally complete formula. Formulas that do not contain any carbohydrate are used for rare disorders where extremely specialized diets are needed. Corn-derived carbohydrates are used in nutritional formulas as a carbohydrate source because they offer a blend of both simple and complex carbohydrates. Simple carbohydrates are absorbed rapidly, whereas complex carbohydrates are digested and absorbed more gradually. In Neocate products, the carbohydrates are in balance with amino acids (the protein source) and fat to provide a balanced nutritional profile. No Neocate products are completely free of corn-derived ingredients. The carbohydrates used in all Neocate products undergo extensive refinement in a multi-step process that includes purification, distillation and drying. This process is designed to remove impurities, including protein and fat, that are naturally present in corn. As proteins are what the body responds to in a typical allergic reaction, this removes the trigger for patients with a corn protein allergy. With that said, we cannot claim that our Neocate products are completely “corn-protein free.” In order to make such a claim, we would need to regularly test for the presence of corn protein, which we do not do. (At this time, there is no validated lab test for corn protein.) We cannot say with certainty that Neocate is “safe” for you or your child – that’s a question for your healthcare team. It is important to note that leaders in food allergy diagnosis and management indicate that true corn protein allergy is rare, and find a majority of patients with corn protein allergies tolerate refined corn syrup solids with no allergy symptoms. In practice, these healthcare teams do not counsel patients who are allergic to corn protein to restrict corn syrup solids from their diet. If you have questions about the safety of the corn syrup solids or maltodextrin in Neocate, discuss this with your healthcare team, especially your allergist. They may recommend a supervised trial of a corn elimination diet or other testing to see if Neocate is appropriate. An individual who is intolerant to corn carbohydrates would probably not tolerate either maltodextrin (from corn) or corn syrup solids better than the other. Since we’re on the topic of corn, I’ll mention two facts that matter to many Neocate families. First, Nutricia requires our Neocate ingredient suppliers to certify to us that the ingredients – including the corn from which Neocate carbohydrate ingredients are sourced – are non-genetically modified through use of modern biotechnology, compliant with European Commission regulations 1829/2003 and 1830/2003. In addition, the corn syrup solids used in Neocate products would not be expected to contain fructose and are not the same as “high fructose corn syrup” or “HFCS”. HFCS is produced from corn starch in which about half of the glucose molecules are chemically converted to fructose. Many consumers prefer to avoid HFCS for a number of reasons, and we do not use this ingredient in Neocate products. Baby Spit Up: Is it GER or GERD?